Home / Blog / We Speak / How to Protect the Android Application? Security Recommendation. How to Protect the Android Application? Security Recommendation. Nowadays, in the global network, the security questions is one of the most important. The huge amount of data every day hits the internet and every user by default want to protect them. Applications and their creators aren’t exceptions. Due to this issue, we asked our dedicated developer about main dangerous and ways to defend the applications. In our fast-moving world with new android mobile applications emerging every minute, lack of privacy, open information at every social platform, which all creates such a vast landscape for all the hackers of the world, surprisingly a lot of those Android applications at their start still forget about the security. Seems like the only developers who actually think about this are those of financial and payment apps. As a result, we have the following situation: when the project is done it is uploaded to the Play Store. Hacker simply downloads APK file (APK is a package file format used by the Android OS) from the Play Store (e.g. via https://apkpure.com/ or some other tool). After that, he can decompile this APK (http://www.javadecompilers.com/apk is just one of the simplest ways) and Hooray! Hacker can see the whole project’s codebase. Even API endpoints (application uses HTTP requests to get information from the server) could be revealed. Above you can see a simple guide to becoming a hacker. As you can see it doesn’t require a huge skillset. Any person who has the access to the computer (which is most of the planet’s population) can do that. Source code and resources/assets obfuscation. 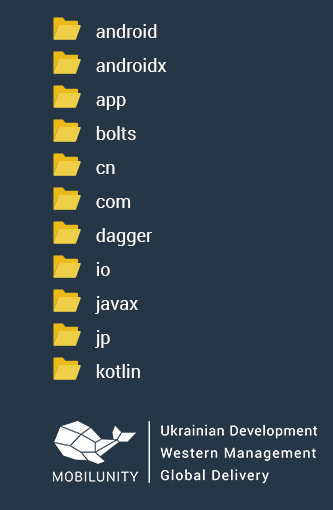 Fully unreadable sources after APK decompile so it’s impossible to do reverse engineering. Integrity control. APK certificate(https://developer.android.com/studio/publish/app-signing) checks, APK content checks. Hackers can’t insert malicious code inside APK file. A few words about root detection. If you allow your application to be installed on the rooted device don’t forget to secure all the locally stored data(especially if it contains some user’s sensitive data) but It would be better not to store such data locally. And here is an example of code obfuscation. Without the security of the Android application, everybody can see something like that after APK decompile. We can see there all third-party libraries, configs, source code. All this information compromises the application. And let’s use one of the obfuscation tools(in this case it’s DexProtector). We will see only files with code and inside them the non-understandable code like below. DexProtector, DexGuard etc. – paid tools with lots of functionality including security ways that were mentioned above. 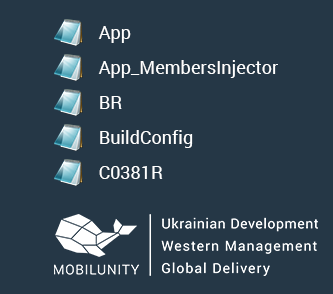 In conclusion, we would like to say that project security should not only be on the mobile developer’s shoulders. The whole team should be involved! P.S. Don’t forget to add checking application protection to the QA’s checklist (at least to decompile APK). Let all of your applications be secure!